Planet 9: A New Planet in Our Solar System? Artist’s rendition of what the ninth planet might look like. Credit: (R. Hurt, Caltech). “In my day, Pluto was a Planet!” said everyone over the age of…15 or so. Pluto was demoted from planet status ten years ago (a decision I do agree with–see here), and now we only have eight planets–or do we? Astronomers Konstantin Batygin and Mike Brown and announced yesterday that they have found evidence for a new ninth planet–one that’s about Neptune-size, but way beyond the orbit of Neptune. And unlike Pluto, this one would definitely be a planet. Mike Brown was the first person to really do a dedicated search for what was then called the “tenth planet”. Ironically when he finally found his planet, Eris, he became one of the loudest voices to have both it and Pluto demoted to dwarf planet status. But he never gave up planet hunting, and now he’s found a new one, referred to only as Planet 9. You can read about his latest discovery in the scientific paper here, or the less scholarly article in Science here. But I wanted to give my own explanation and clear up a few things today. So did they actually discover a new planet? No. No one took pictures with a telescope and spotted this new planet. This is circumstantial evidence only. Based on the motions of smaller objects in the outer Solar System, Dr. Batygin and Dr. Brown inferred that there must be some large object out there influencing them with its gravity. This is the same method that was used to discover Neptune in 1846. But there’s definitely a planet out there, right? Well…probably. We don’t have absolute proof. The chance that the weird motions of objects we’re observing happened purely by chance is only 0.007%. But purely by chance rarely happens in real life, and results that seem that certain have been known to disappear when we look closer. And even if those odds are real, they could always turn out to be from some other weird effect like an encounter with a passing star millions of years ago…But I’d still put it at more likely than not that there’s a planet there. So how did they figure this out? Basically, they were inspired by one really weird object: Sedna. Sedna is in what should be an impossible orbit. It stays far from the Sun at all times–too far to have formed there from the primordial disk. And it never comes near any of the known planets, which would be necessary to throw it out that far from a closer distance. This suggests that it was the gravity of some other, unknown object that got it out there. Then, in 2012, another weird object with an impossible orbit was discovered: 2012 VP113, informally code-named “Biden”. This object is in a fairly similar orbit to Sedna where it really shouldn’t be. And then, there are other objects that are in not-quite-impossible orbits. These do come close to Neptune’s orbit, but they also wander much farther from the Sun than astronomers are really comfortable with. Batygin and Brown analyzed six of these weird objects in total and were surprised to find that they’re all orbiting in the same part of the sky. This suggests that they are subject to a common gravitational influence–suggests very strongly, in fact, given those 15,000 to 1 odds that it’s random chance–a result that would be best explained by the new Planet 9. Is this really a planet? It won’t get demoted, will it? No, it won’t. The definition of a planet is a little fuzzier than the IAU wants you to think, but the important thing is that it’s gravitationally dominant over the other objects around it. Since Planet 9 is able to push these small bodies around, it’s definitely gravitationally dominant and is definitely a planet. Based on the motions of those small bodies, we can estimate pretty well where the orbit of Planet 9 is. The new planet likely comes no closer than 200 AU from the Sun, seven times farther than Neptune and three times as far as Sedna’s closest approach. At its farthest, it could be anywhere from 600 to 1200 AU. Its orbit points the opposite way from Sedna and the other objects Batygin and Brown studied because it would need to be closest–and its gravity strongest–when it’s in the other direction where the other objects got pulled out of their normal orbits. They don’t know exactly where it is, but that estimate of its orbit gives then a good idea of where to look. Planet 9 has to be bigger than about 10 times the mass of Earth for its gravity to do what it does. That means it’s probably about Neptune-size. We can say the maximum size it can be, too. A big planet, like Jupiter, would glow in the infrared from its own internal heat, even that far from the Sun. NASA’s WISE spacecraft was an infrared telescope that searched for new planets (among other things) using that very method. They found nothing. Now, WISE could have found a planet the size of Saturn at 10,000 AU from the Sun. It could have found a planet the size of Jupiter at 26,000 AU. But there’s not a lot of information about whether it could have spotted a planet the size of Neptune. It might have just missed it. Still, we can say from these results that Planet 9 must be smaller than Saturn and is probably closer to the size of Neptune. So how close are we to actually finding Planet 9? Probably about five years. We know roughly where the orbit of Planet 9 is, which eliminates a large part of the sky from the search, but we don’t know where it is in its orbit. Batygin and Brown and their rival team, Scott Sheppard and Chad Trujillo (who discovered Biden), are joining forces on a 5-year program to find Planet 9 using the Subaru telescope in Hawaii (which is named for the Pleiades star cluster, not the car company). Subaru has one of the biggest cameras in the world today, which is called–and I am not making this up–the Hyper Suprime-Cam. With its 1.5 billion pixels, it can search the sky faster than just about any other telescope in the world today, but it will still take time. 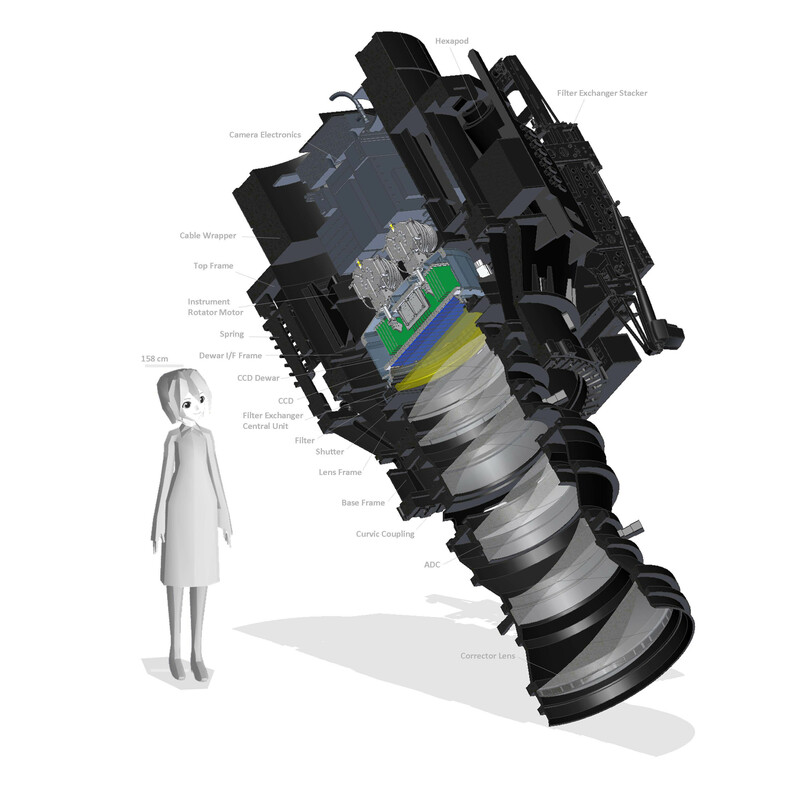 Subaru’s Hyper Suprime-Cam to scale with a human. Yes, really. Credit: NAOJ/the Subaru team. Planet 9 is a dumb name. Are they going to give it a real one? Yes, but not until they actually discover it. The IAU normally gets the final say with planet names, but they might not get the chance this time. Dr. Brown has defied them before–naming Sedna without consulting them. Similarly, his Pluto-defending rival Alan Stern named a bunch of geographical features on Pluto without consulting them either. This time, Brown and Batygin hope to crowd-source a name for Planet 9 before they discover it. They themselves are partial to George, after William Herschel’s original name for Uranus, which he tried to name after King George III. My personal preference: Niflheim, the realm of eternal cold in Norse mythology. Is this Planet X, and will it kill us all? No. 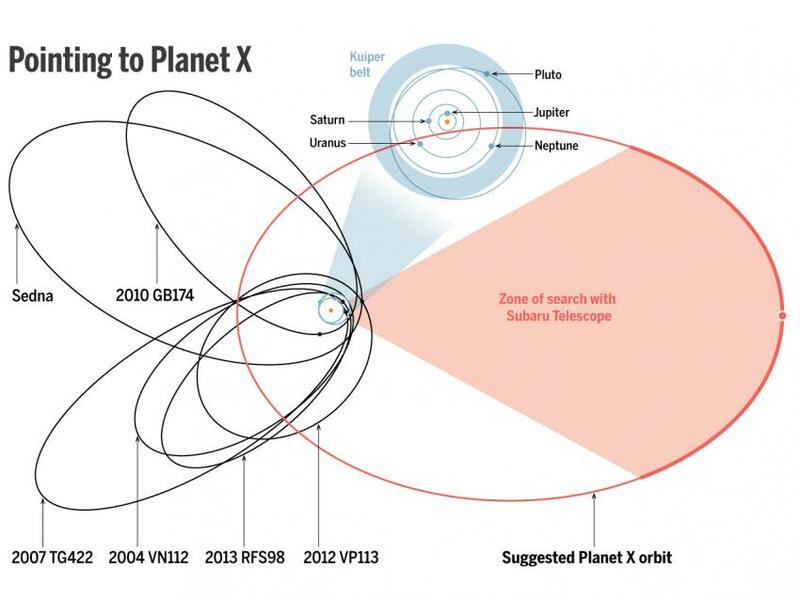 You might be still able to get away with calling it Planet X, but no. Just no. 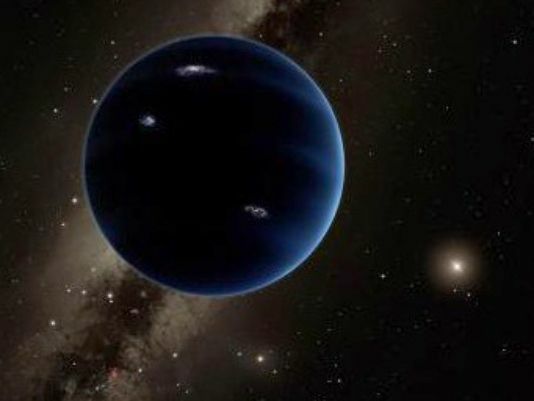 This entry was posted in Planets, Science, Space and tagged 2012 vp113, mike brown, Neptune, Planet 9, pluto. Bookmark the permalink. 1 Response to Planet 9: A New Planet in Our Solar System?